I’ll be rooting for the Netherlands for the rest of the World Cup. Why? Because I like tulips and windmills and the kid with his finger in the dike. Because I think it’s remarkable that such a small country has such a successful soccer history, and I think it’s about time for them to finally get their hands on the top trophy. Because they have such a good healthcare system. Because — at least in my experience — they seem to combine friendliness with a surprisingly robust sense of rationality. Because Switzerland and Denmark didn’t make it out of group play. Because I’ve liked the Netherlands since the first time I visited. 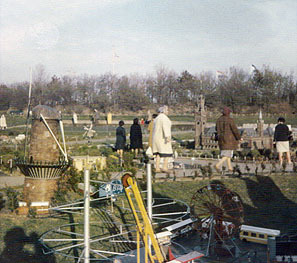 So in honor of the Netherlands, here’s a snapshot taken during that first visit in 1967. This is Madurodam, a miniature city in The Hague that my brother and sister and I were all pretty captivated by at the time. Beat that, Legoland. Judging from their website, Madurodam has been considerably spruced up since our visit, and I suppose that means I should take a trip over to Europe one of these days and check it out. In the meantime, though, I’ll settle for rooting for their soccer team.